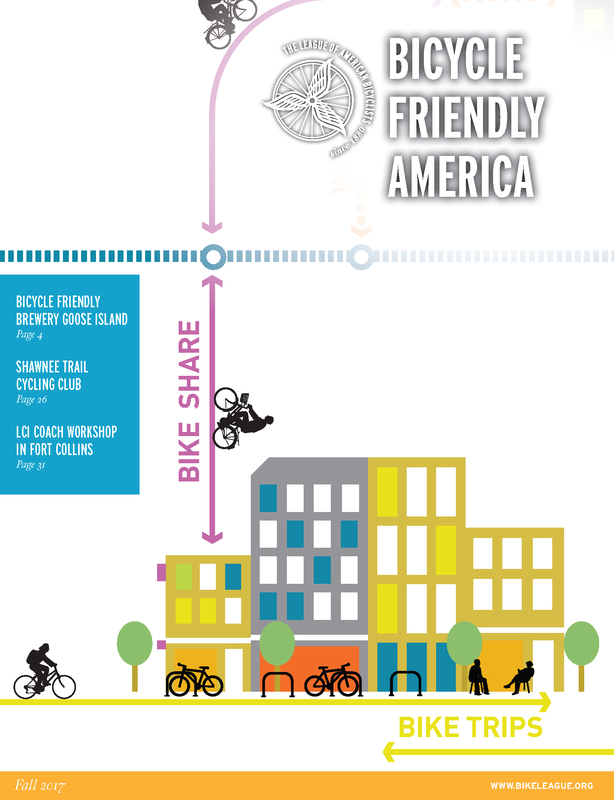 Your membership helps make biking better for everyone, nationwide. If that weren't enough, your membership also comes with some specific discounts and special offers, outlined below. All paid memberships include our digital magazine, Bicycle Friendly America, and discounted registration to the National Bike Summit. Members may choose additional digital subscription(s) to Bicycling, Dirt Rag, and/or Momentum. All memberships at the Individual level and above feature a print subscription to Bicycling Magazine! The Bike Line stores in Pennsylvania and Delaware offer discounts of 5% on the purchase of bicycles and accessories to card-carrying League members. Bikes-R-In in Swansboro, N.C. offers League members a 15% discount on bikes and 25% off on parts, accessories, service and rentals. BikeStoreGuys.com offers a 15% discount on your entire order for League members. Use Promo Code: LAB. Offer valid on Accessories/Parts orders, offer not valid on Bikes and In-Store Pickup orders. Landry's Bicycles shops in Massachusetts offer discounts of 10% on the purchase of parts, accessories, and clothing. RollsRite Bicycles in Clyde, North Carolina offers 10% off of regular price on bikes, parts, accessories and service to current, card carrying League members. Salem Cycle in Salem, Massachusetts offers League Members a 10% discount on in-stock, non-sale parts, accessories, and clothing. Must show valid member card at beginning of purchase process. Discounts may not be combined with other offers. Takoma Bicycle in Takoma Park, MD offers League Members a 5% discount on bikes and a 10% discount on parts and accessories. Must present valid membership card at time of purchase. Bike Friday: League members can receive 5% discounts on the purchase of Bike Friday® bicycles, the world's leading performance travel bicycle. Each Bike Friday® is custom fitted, folds in 30 seconds, packs into an airline checkable suitcase (so you can avoid carrier fees and boxing hassles) and rides just like your best bike. The fit is guaranteed! Whether you do touring, road, mountain, commuting, recreation, tandem, or recumbent riding, your personal Bike Friday can be designed and ordered by phone, fax or e-mail and delivered direct to your door. Note: League members will need to provide their membership number when placing an order to receive the 5% discount. Diamondback Bicycles: League members enjoy up to 40% off retail prices through our corporate partnership. Please contact membership@bikeleague.org with your membership number for our login code. Prevelo Bikes: The Prevelo Bikes mission is simple: make bikes for kids that are as confidence inspiring, easy, and fun to ride as possible. All Prevelo bikes are 100% engineered for kids from the start. League members enjoy 5% off all orders. Email membership@bikeleague.org for your unique discount code. Pure Cycles was founded with one mission in mind: to get more people on bikes. For 6 years we’ve been designing, developing, and delivering the coolest bikes on the market and it’s been a blast to watch our brand and our bikes spread around the world. League members receive 20% off any item online using the code "pureleague." Raleigh Bicycles: League members enjoy up to 40% off retail prices through our corporate partnership. Please contact membership@bikeleague.org with your membership number for our login code. Arkel Inc. crafts the finest panniers and racks in world since 1988. Known to cyclists exploring the world and commuters heading down the block as the best bags in the business, period! Arkel uses only the most durable materials to create functional, weather proof and water proof panniers – bags and racks that incorporate brilliant advances made by craftsmen who actually cycle. All with a bulletproof guarantee that only faith in the quality of the product can yield. Arkel knows that the League members are kindred spirits - activists and explorers at heart. A 10% discount is offered with a big smile to League members, because you make a difference in the world. Thanks for joining both the League and Arkel's community. Remember to provide your membership number. Gear Trade: GearTrade is the premier marketplace to sell your road and mountain bike gear. Members receive a 30% discount when you sell your old outdoor gear on GearTrade. Listing your gear is free and we handle all the payment processing and customer service. Sign up for a free account here: https://www.geartrade.com/user/signup . Simply email rreinfurt@geartrade.com with your GearTrade username to apply the discounted commission rate of 9%. Rickshaw Bagworks of San Francisco offers a wide range of messenger and other bags. League members receive a 10% discount. Use code LAB2011 online, or show your membership card in-store. Road ID: Always Ride with Road ID! Want some peace of mind while you ride? Equip yourself and loved ones with the one accessory no cyclist should be without—a Road ID. Simple, stylish ID that you customize with the information most important to you, from emergency contact numbers to vital medical info. And as a member of The League, enjoy a FREE $10 Gift Card! Zealios: Body and hair care products designed and tested by top endurance athletes. The Zealios collection includes 8% zinc sunscreen that dries clear and doesn't burn eyes, aloe-based chamois cream, and a chlorine-removing, sulfate free line of shower products and lotion. Use discount code: ZupBIKELEAGUE19 for 15% off all items on www.teamzealios.com. Valid now through 2/1/2020. AmeriCan Cycling Adventures. With a mix of classic rides and off-the-beaten-path routes, AmeriCan Cycling Adventures has carefully developed a range of tours featuring the most incredible cycling adventures in North America. League membership is valid for $150 off any direct booking. Receive your custom discount code by contacting cycling@americanadventures.com or call 707-525-6763. Austin-Lehman Adventures, with a 37-year legacy, provides adventure vacations on five continents, has built an international reputation for small group active travel to destinations in North, Central and South America, Europe, the Pacific Rim and Africa. Austin-Lehman Adventures specializes in first class biking tours and multisport adventures for adults and families; that emphasize history, culture and nature's charms. Austin Lehman Adventure Travel is offering 5% off any of their dedicated biking tours to all Bike League members, for more details and to reserve your trip today call us at 800-575-1540 or email us at info@austinlehman.com. Learn more here: www.austinlehman.com. Bike Florida is offering $35 off of registration for their tours for League members. Use code LAB2011, and enter your membership number where indicated. a one-stop-shop for you to research, plan and book your next cycle vacation. CycleLifeHQ is also offering all League members 30% discount on their Premium subscription service, giving you access to special deals with bicycle friendly cafes, lodging and retailers, as well as custom maps! Contact membership@bikeleague.org for your exclusive discount code. Easy Rider Tours is an international company that specializes in cycling adventures in Europe and North America. Their tours are designed to accommodate riders of all levels with a "go local" ethos, from their native guides to accommodations at local inns. Easy Rider Tours is offering League members a $150 discount on all of their trips. Email info@easyridertours.com to take advantage of this offer. Flambeaux Bicycle Tours is a locally owned and operated New Orleans bike tour and rental company. Experience the crescent city in style. Your certified tour guide will make our 300 year old city come alive! He or she will teach you about the characters and events that have helped write New Orleans’ unlikely story over the centuries. Pedaling on one of our top-quality city bikes allows you to cover more ground than you can on foot, and to feel more New Orleans vibes than you can on a tour bus. Take in the city with all five senses, at a leisurely pace that only bicycling can provide. It will be the highlight of your trip! Use code BikeEasy at checkout for 15% off, and verify your membership with your member card in-person. Freewheeling Adventures: Freewheeling Adventures are supported, guided or self-guided bicycle tours, hiking/walking tours/holidays, and sea-kayak paddling trips. You can join a small group or reserve a private trip. Either way, these are extraordinary active holidays. Our professional commitment and helpful service are refreshingly reliable, whether you choose to travel to our home in Nova Scotia, Canada, or our favourite bicycle tour and hiking tour destinations in Iceland, Europe, Israel, Mexico, Costa Rica, or Japan. League members enjoy 50% off bike rental as part of any Atlantic Canadian adventure. Email membership@bikeleague.org with your member number for a code. Roar Adventures: League of American Bicyclists Members SAVE 5% OR MORE on amazing bike tours around the globe with Roar Adventures. Roar Adventures' team of cyclists hand-picks amazing bike tours, bringing you a broad range of cycling experiences with top-notch service and knowledgeable local guides. Find your next bicycling travel adventure and take advantage of your member discount at RoarAdventures.com. SNO specialize in active travel and their cycling vacations include guided and self-guided excursions for every level as well as airplane bike carriage or hire in resort. Choose between iconic road biking and mountain biking destinations across Europe, North America and beyond, with accommodation ranging from quaint Alpine chalets to luxury all-inclusive hotels. Cyclists can quote their League member number to get a 5% discount off the brochure price of the trip. VeloTopo - Europe Custom Cycling Tours. A true bespoke bike tour with itineraries designed to perfectly match your abilities and desires is what you’ll enjoy with VéloTopo. We’ve selected the best hotels and restaurants and offer unmatched support. Our testimonials, Facebook page, and Instagram photos illustrate the adventure of a lifetime you’ll enjoy with VéloTopo. VéloTopo offers $150 discount to members. Check www.velotopo.com and email bike@velotopo.com for your next cycling adventure. The Alexander House Booklovers Bed and Breakfast in the lower Eastern Shore of Maryland is a literary themed bed and breakfast. The 1885 Victorian is filled with books and literary items celebrating books and authors. It offer a healthy gourmet menu, with emphasis on organic, vegetarian and international foods. Innkeepers Peter and Elizabeth Alexander like to promote the concept of one less car, and the inn is within walking or biking distance to many places of historical or architectural interest, as well as some incredibly beautiful, pristine nature areas. The Alexanders offer cyclists a 10% discount while on biking expeditions. (not available on holiday weekends). The Bear Valley Inn, in Marin county, CA, owned by former League Board Member Amanda Eichstaedt and her husband Ken, offers card-carrying League members a 10% discount, and a 15% discount to anyone who bikes to the Inn! The Harbour House Hotel, in Salt Spring Island, B.C., is located at the head of Ganges Harbour, within walking distance of Ganges Village. The hotel offers 36 clean and comfortable non-smoking rooms. The deluxe rooms feature a king bed, double whirlpool bathtub and a fireplace on your covered deck. The ocean view rooms offer a large balcony and beautiful views of Ganges Harbour. The hotel offers a 10% discount to cyclists as part of our green initiative. This is available all year round. Visit saltspringharbourhouse.com/rooms.htm for more. Levi Deal Mansion, Meyersdale, PA: Come stay with us at the Levi Deal Mansion, considered by many to be the Gem of the Gap. The accommodations - luxurious, the food - exquisite, and the welcome - warm and inviting. Book today and receive a complimentary collectible mansion coffee mug upon check out. Email membership@bikeleague.org for your code. BikeFlights.com makes it convenient, reliable and affordable for you to get your bike to wherever you want it to go, whether it’s for your next event, vacation or work trip, or you’re buying or selling a bike online. With BikeFlights.com Best Way Guarantee, you get the best price, on-time delivery and best service with each shipment. LAB members save $10 off all round-trip shipments (or $5 off per leg) with BikeFlights.com. Contact membership@bikeleague.org for a direct link. Spinlister is Back! Spinlister is a premier bike rental and sharing service that provides a platform to connect bike owners with active people looking to rent or borrow around the world. Through our service, owners list their bikes, renters search for a bike in whatever area they want, and complete the rental process easily through our website, mobile app, or in-store kiosks. League members receive 50% off peer-to-peer rental and listing fees. Contact membership@bikeleague.org to redeem. Balance for Cyclists -- Balance for Cyclists helps protect cyclists from the life-changing financial consequences of crashes - it's like a helmet for your wallet. When you ride with Balance, you're covered anytime and anywhere you’re on a bike. Our defined benefit plan pays you on top of any insurance you already have. Because for cyclists, health insurance is not enough. All Bike League members are eligible for discounted premium rates on individual plans. Use the group code “LAB” at checkout. Choose the coverage amount that’s right for you - our plans provide $50,000 to $150,000 of coverage. BicycleGifts.com -- BicycleGifts has one of the largest selections of original vintage cycling posters available as well as over 180 fine art poster prints in sizes for any area of your home or office. They also offer unique after cycling wear, fun jerseys, cycling jewelry, sculptures, recycled gifts and much, much more. League members receive a 10 percent discount on all merchandise purchases. Use code LABMBR at checkout. Island Press began with a simple idea: knowledge is power - the power to imagine a better future and find ways for getting us there. Founded in 1984, Island Press’ mission is to provide the best ideas and information to those seeking to understand and protect the environment and create solutions to its complex problems. We elevate voices of change, shine a spotlight on crucial issues, and focus attention on sustainable solutions. League members receive 30% off books at islandpress.org. Email membership@bikeleague.org for your code. MyTripJournal.com offers travelers a cool way to create an online travel website, complete with intelligent, interactive maps that show your travels anywhere and the ability to add journal entries and photos from any PC or internet café. League members will receive 15% off all Premium MyTripJournal websites, giving you unlimited photo display, storage of your photos in print quality, and a free CD of your trip website. This is a savings of $8 off 60-day Premium websites and $15 off 180-day Premium websites. To get your discount, visit MyTripJournal and enter code WNWPUR on the checkout page. You can further support the League with a purchase from these supporting vendors. Shopping at Amazon.com? Use Amazon Smile and search for "League of American Bicyclists." We'll receive a portion of the proceeds from your purchase. Want to invest in clean energy while boosting bicycling in your community? Enroll your utility bill with Arcadia Power and your home energy will be offset with 100% clean and independent wind energy. Sign up with our unique link here and Arcadia Power will donate to the League in recognition of your support. Choose between a free plan and a low-cost 100% offset option.